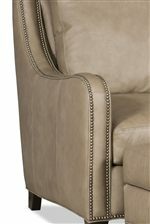 Usher in a new age of entertaining guests at your home with a gorgeous, new modern classic armchair. Sink into plush, down wrapped cushions while you entertain with chit chat and hors d'euveres, or unwind after your gathering with some solo TV or computer time. Custom nailhead colors, wood finishes, and leathers are available to match this striking look to your distinctive color palette. The Greco Transitional Chair with Curved Track Arms and All-Over Nailheads by Bradington Young at Lagniappe Home Store in the Mobile, Daphne, Alabama area. Product availability may vary. Contact us for the most current availability on this product. The Greco collection is a great option if you are looking for Contemporary furniture in the Mobile, Daphne, Alabama area. Browse other items in the Greco collection from Lagniappe Home Store in the Mobile, Daphne, Alabama area.